Omar Hassan A. Al-Bashir, President of Sudan. After more than two months of near-daily protests in Khartoum and across Sudan, President Omar al-Bashir announced on the evening of February 22 a year-long state of emergency and dissolved the government. He postponed constitutional amendments allowing him to run for office again in 2020 but did not offer to step down. In the following days, al-Bashir issued additional decrees outlawing protests, setting up emergency courts, and appointed loyal military men in key roles. Significantly, he appointed Ahmed Haroun, former governor of Northern Kordofan, as acting head of the ruling National Congress Party. Both Haroun and al-Bashir are wanted by the International Criminal Court for alleged atrocity crimes in Darfur. While the new government was purportedly established to help address Sudan's economic crisis and appease critics, it has not ended the protests, nor the government's abusive response. On the night of al-Bashir's announcement, security forces raided a doctors' residence in Khartoum, looted property, and arrested more than 50 people, according to the independent doctor's syndicate. Two days later, they raided the University of Medical Studies and Technology, shot tear gas into the building, and . On February 25, government forces shot at protesters, injuring three, the syndicate said. Such reports are hardly a surprise. Since protests started in mid-December, security forces have consistently used excessive force, shooting live bullets and tear gas canisters at protesters, killing and injuring protesters, violently raiding homes, and brutally beating protesters and detainees. Many opposition figures, rights defenders, and activists are languishing in national security detention. 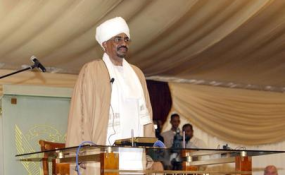 Now al-Bashir's emergency courts are another tool for repression. Hastily-formed courts set up by chief justice Abdelmajid Idris on February 25 have convicted hundreds of people in summary trials - for crimes such as protesting and disseminating anti-government information - without due process or access to lawyers in many cases, witnesses told us. Sentences range between fines up to seven years in prison. Troika countries and Canada warned that "return to military rule does not create a conducive environment for a renewed political dialogue or credible elections" and the European Union warned the increased role of the military creates "a permissive climate for the security services to act with impunity against peaceful protesters." US Congress members have called on the US to abandon its efforts to normalize relations with Sudan. These governments should now go a step further, including by taking action at the United Nations Human Rights Council to authorize an independent investigation into all the killings and abuses.